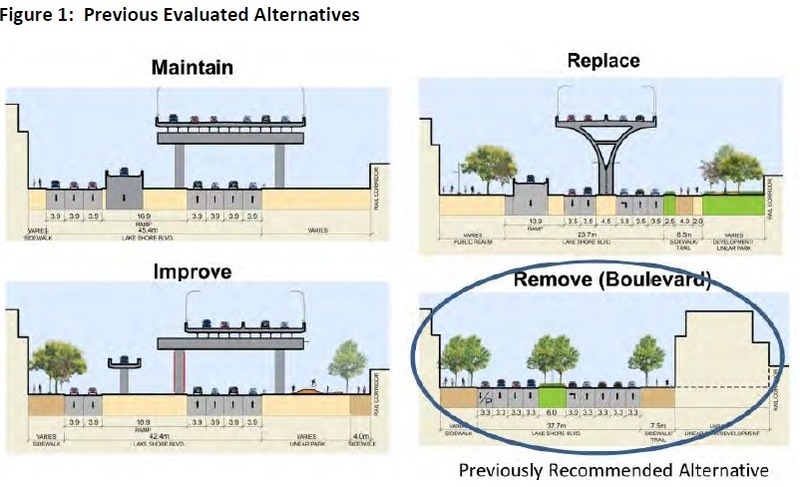 Both the Improve and Replace options would involve reconfiguration of Lake Shore Boulevard under the expressway to the extent that the expressway structure would allow. When this was before Council, there was much concern about the travel time estimates and congestion in general. Some of the projected times did not, on their face, make sense to Councillors or the change in travel times were unacceptably large. 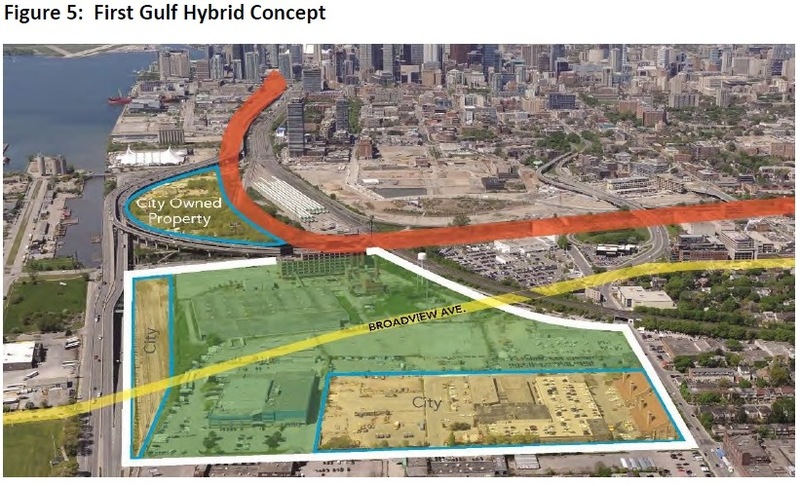 Further issues arose from an alternative “Hybrid” proposal put forward by First Gulf, developers of the former Unilever site east of the Don River. Access to their property is constrained by existing structures, notably the residual “Scarborough Expressway” branch which descends to grade at Logan Avenue and Lake Shore Boulevard east of their site. 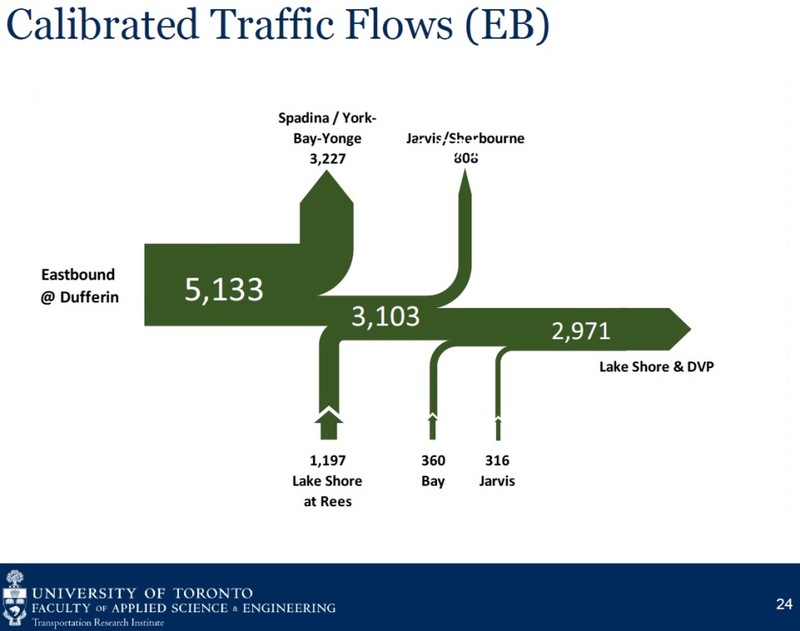 The Hybrid scheme eliminates the Scarborough ramps so that the merge of expressway traffic into Lake Shore occurs west of the Don River rather than east of it. This opens up the south side of the First Gulf site. As for the Gardiner/Don Valley Parkway ramps, these would be shifted so that the Gardiner, instead of swinging south along the edge of Keating Channel, would lie further north adjacent to the existing GO Transit Don Yard. Council sent the whole package back to the planners asking that (a) they review travel time projections and (b) report on the Hybrid Option. It is this report that has now come back to Council. The transition between the Gardiner and DVP would have required a very sharp curve that could not be driven at expressway speeds. This would form a bottleneck to road traffic and would be a safety hazard because of the sudden transitions between high speed expressway driving and a much slower curve. The proposed alignment conflicts with a Toronto Water facility east of Cherry Street and a sediment control basin for the Don River. The Hybrid has been reworked so that it follows the same curve as the existing Gardiner/DVP link, but the Scarborough branch splits off with new ramps west of the Don merging into Lake Shore Boulevard. The ramps down from the Gardiner to Lake Shore begin west of Cherry rather than east of the Don River as they do today. Lake Shore Boulevard would cross the Don on a widened bridge, and east of the river, there would be no elevated structures. The ramps between the Gardiner and the DVP are rebuilt in their current location starting from the elevated structure immediately north of the Keating Channel and swinging across the river to “land” on the DVP just south of the railway bridge that carries GO Transit operations east from downtown. This bridge cannot be moved because doing so would require complete realignment of the rail corridor. The railway berm doubles as part of the flood protection system. Much of the development shown above does not yet exist, and the form of the Don River is completely changed to its new “naturalized” state. South of the Lake Shore bridge, this takes the river south parallel to the Don Roadway and then west out into the lake. Northwest of the DVP ramps is a sediment control area for the river. Some of the buildings west of Corktown Common (the park north of the rail corridor and west of the Don) have been built as part of the Pan Am Games Athletes’ Village, but more are to come. The land south of the rail corridor is only just beginning to develop, and that activity is at the western edge of the illustration. The area south of the Keating Channel, known as “Villiers Island” is now mainly vacant. The road at the south side of the development shown above is Commissioners Street. Two new bridges will be added linking across the Keating Channel. One is at Munitions Street and the other is at a relocated Cherry Street that shifts west from its current location. The new bridge will not be a lift bridge because there will be no need to provide clearance for tall vessels into this area. Transit connections via a realigned Queens Quay and New Cherry Street will serve the Port Lands including Villiers Island. Not shown on the map is a possible connection east via Commissioners to an extended Broadview Avenue. From a neighbourhood design perspective, the alignment of the Gardiner along the north side of Keating Channel limits the options for opening up this area as a continuation of the planned Waterfront Promenade that is already an integral part of developments further west. The Boulevard option has undergone minor changes to improve intersection operations between Cherry and Jarvis Streets in an attempt to reduce the travel time penalties of this configuration. In the Boulevard option, all of the traffic flow east of Cherry stays further north than with the Hybrid option on a consolidated, 8-lane Lake Shore Boulevard. This splits at the DVP giving two lanes in each direction to the DVP and to Lake Shore east of the river matching the current configuration, but with much less elevated structure, and with the road at the water’s edge only for the Don River crossing. 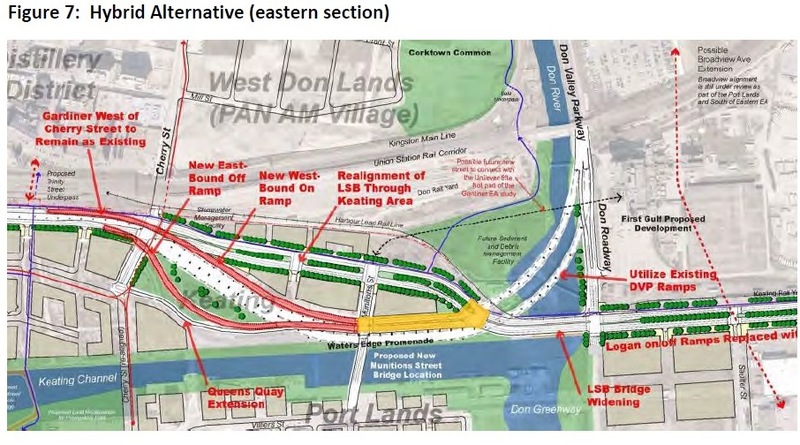 If the DVP ramps stay in their present location, land west of the Don and north of Keating Channel that was expected to be available for development on the water’s edge will be occupied or hemmed in by them. The Boulevard option, combined with other plans for the West Don Lands, East Bay Front and Villiers Island, establishes the entire area as one of “local” streets rather than as one dominated by the expressway structure. The major tradeoffs come in which vision of the waterfront, and of downtown Toronto in general, is the priority for citizens and politicians. City studies have provided two different sets of estimates. The first was in the February 2014 report that triggered the current round of debate. Note that travel times have already grown from locations to the northeast that are served by the DVP between 2001 and 2012. This is due to added congestion on the DVP that is not affected by the Gardiner options which have not yet been implemented. The DVP’s capacity is constrained further north with a considerable amount of traffic leaving at Eglinton and at Bloor. By 2031, travel times are expected to rise by another five minutes even with the current structure for trips originating on the DVP or Gardiner West. During the 2014 discussions, attempts to understand the numbers in the chart above proved quite frustrating. For example, the Improve and Replace options produce longer travel times from all origins than the Maintain option, but the reason for this was never explained. The compound effect of all of the increases between 2012 and 2031 Remove is quite substantial, and options that retain the Gardiner do only slightly better. The fundamental issue is that there is only so much road capacity to go around, and as long as there is growth in road travel, congestion will get much worse even if the Gardiner stays in an elevated configuration. Another important issue is the growth in travel times from location “C” in the map, the southwest corner of Scarborough. Much of this traffic flows along Kingston Road, Woodbine and Lake Shore merging into the downtown street system at the Don River. For many drivers, location C is a midpoint, not the start of their journeys, and their total commute times from other parts of southern Scarborough will be affected by road capacity limitations there too. 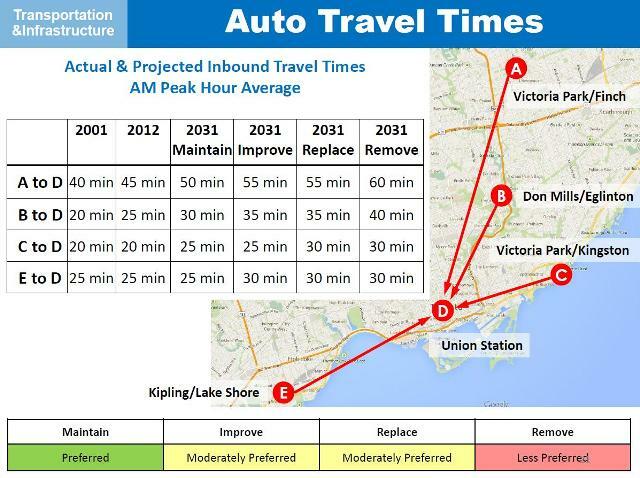 Travel times from “A”, “B” and “E” on the map are affected by existing capacity constraints moreso than from “C”, but that eastern approach via Lake Shore is filling up. This is demand the Scarborough Expressway was designed to address, but like its cousin, the Spadina Expressway, it would have done more harm than good. Eventually, motorists have to accept that growth cannot be achieved by auto travel. That’s fine provided that there is an alternative. In 2015, the projected travel times have changed somewhat. The “2031 Base Case” above is the “Maintain” option of 2014, and right away we can see that the projected times have changed slightly. This should be explained, although it may simply be a case of rounding in the 2014 report where all values are multiples of 5. 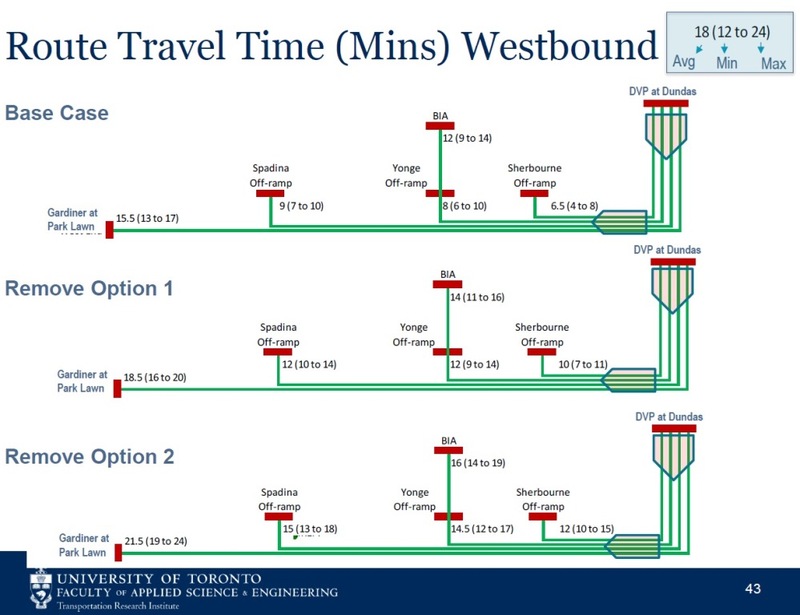 For DVP and Gardiner West origins, the Hybrid option has the same travel times as the Base Case, unsurprising given that it is only a slightly modified version of what is there today. 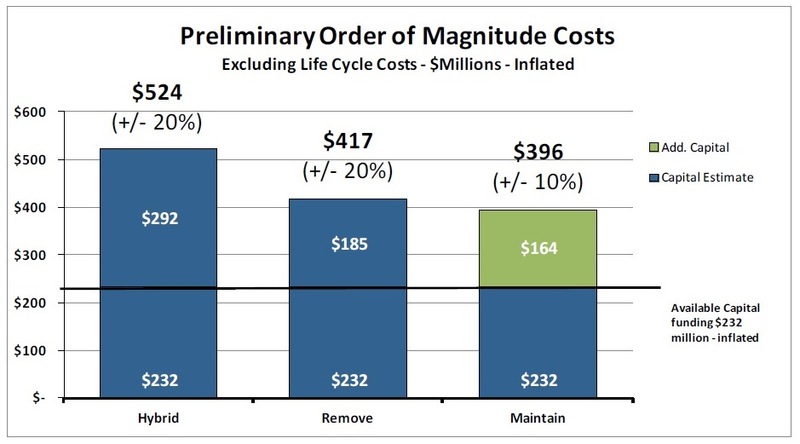 The Improve and Replace options are no longer on the table, but the question remains from 2014 of why their projected times were higher than the Maintain option, and more importantly why the 2015 Hybrid option performs better than those two abandoned schemes. Where the Remove (Boulevard) option was 10 minutes higher than the Maintain option in 2014, this difference has been wrestled down to only 3 minutes through design changes. This is rather difficult to believe given the relatively small portion of the Gardiner East that has been “tweaked” in 2015, and the study authors would have done well to explain this in greater detail. Their failure to do so, as in the 2014 report’s lack of detail, undermines the credibility of the Boulevard option. Again the “C” origins from southwest Scarborough face longer travel times regardless of which option is chosen. This study examines two variants of the Remove option, but does not consider the Hybrid scheme. The principal difference between the variants lies in the treatment of competing demand for road capacity. In one variant, the focus is on pedestrian movement, while on the other the focus is on auto traffic. This affects design elements notably signal timings where the two types of traffic will conflict. Simulations of traffic flow (pp. 15-18) for each configuration show that there is little change in traffic volume between the Maintain and Replace options. This is related to another observation in the City’s study which found that demand on the expressways is not affected by the presence or absence of transit such as GO improvements, SmartTrack, the DRL or the Waterfront LRT line. 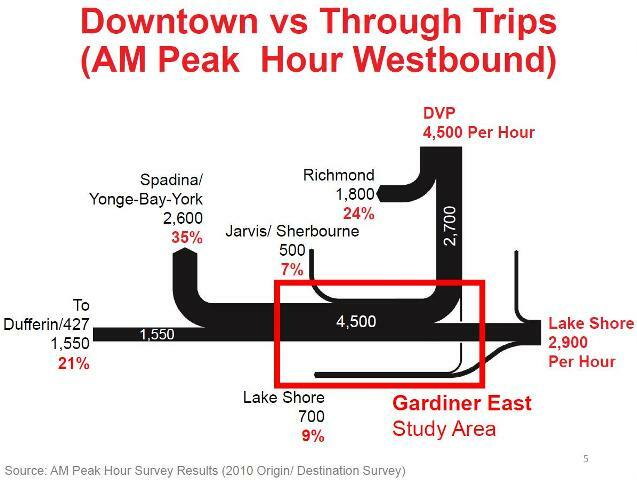 These findings are not surprising given that the traffic flowing into downtown from the DVP is a very small fraction of the total peak demand, and the road network has been “full” for years. With new transit, some existing trips may divert from the expressways, but these will easily be backfilled from existing demand. Without new transit, there is no capacity for the road network to absorb more trips, and so transit gives the impression of being “without effect”. What is missing both in the Gardiner Coalition and City studies is any discussion of the scale of growth that is expected on the transit system and various proposed components of that network. I will return to this point later. 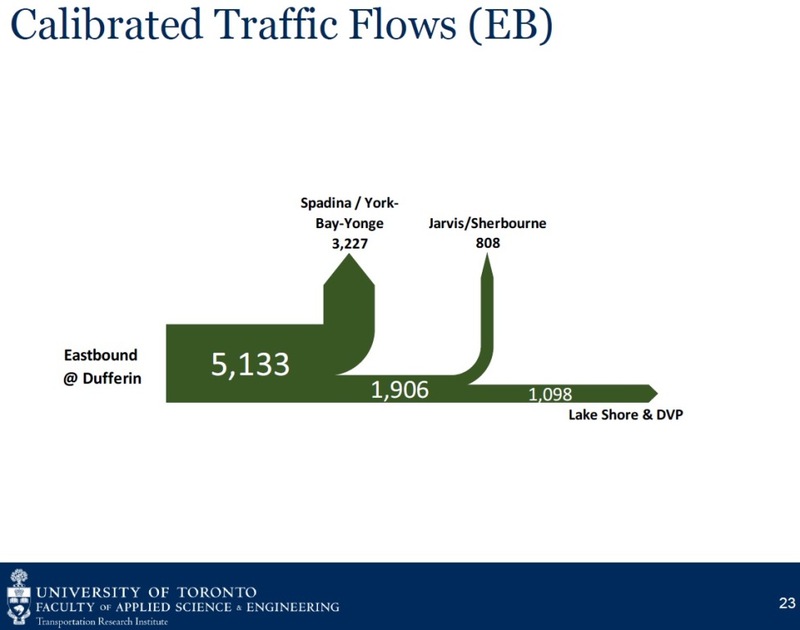 Both the City and Coalition studies use projected traffic volumes on the DVP, Gardiner and Lake Shore as their starting point. There are differences between the numbers, but generally speaking the volumes are comparable. In both models, approximately 7,400 vehicles arrive via the DVP and Lake Shore, and they are dispersed to various destinations. 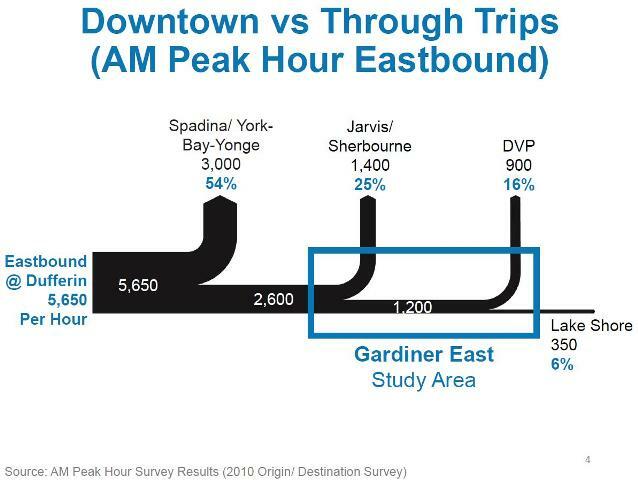 The demand on the segment between the DVP and Jarvis Street is almost identical in both models. 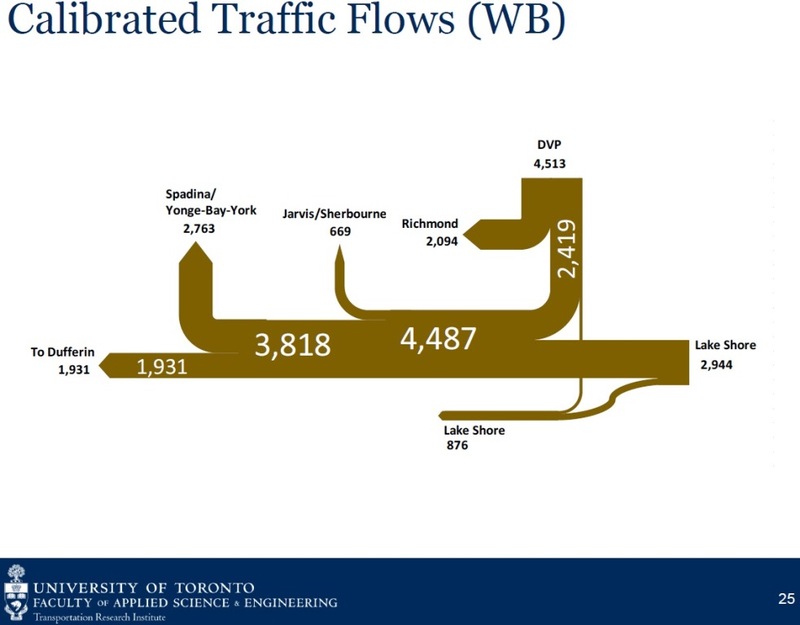 The Coalition study also includes a chart showing traffic that joins the Gardiner westbound at Jarvis and at Bay/Spadina. These add considerably to traffic west of Jarvis, but that section of the road is not under discussion. However, this volume must be factored into the behaviour of intersections, notably at Jarvis and the Gardiner/Lake Shore. For eastbound traffic, the basic numbers used by both the City and Coalition studies are similar, but there is an important difference in that the Coalition also shows eastbound traffic joining the Gardiner at downtown access points, not just the traffic coming east from Parkdale and points west. 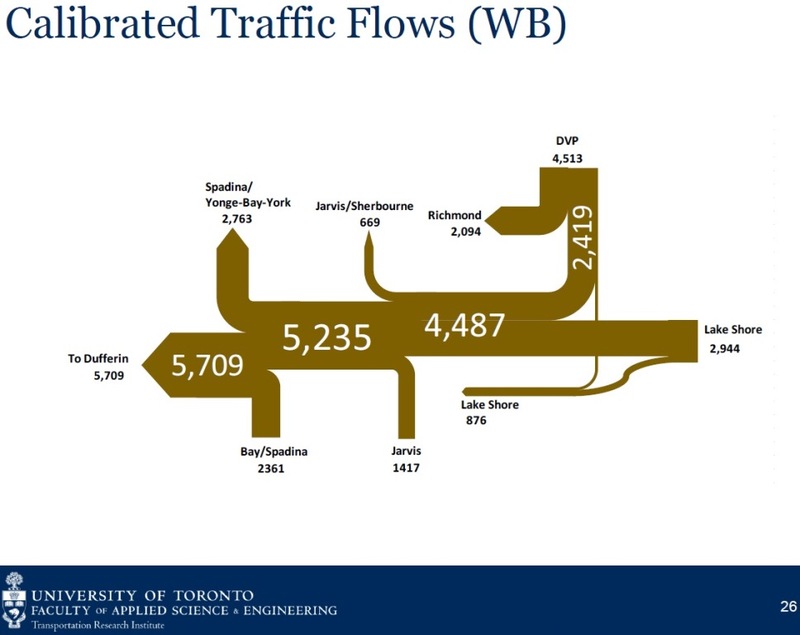 Unfortunately, the Coalition study shows these added flows, but does not discuss how they affect the modelled behaviour of the road network notably the degree to which the Remove option might cause traffic to back up into the higher speed sections of the DVP and Gardiner approching the revised central section. Different speeds and intersection signal timings to favour traffic, or to favour pedestrian activity, notably north-south crossings of the Boulevard. There is no explanation of why the bike lanes were not included in the Base Case model if they are to be part of the future road network regardless of what happens to the Gardiner. Taking some capacity away from Richmond westbound could produce queueing back onto the southbound DVP, but this is not by itself an effect of the Remove option. These two factors need to be disentangled. An obvious related question is whether the City models included the bike lanes, and if so what was their effect on the behaviour of each option. The simulated flows for the Gardiner eastbound in the Coalition study are intriguing because they show a reduced flow for the Remove option with pedestrian emphasis whose effect stretches west into Parkdale. This implies that traffic will be unable to exit as efficiently as it does today at Jarvis and points west to downtown because of backlogs of traffic pushing west from Jarvis. Another way of looking at the demand modelling is to review trip times for various trips through the core area. The Coalition report shows this in the following diagrams. For westbound trips, the difference between the base case (Maintain) and both of the Remove scenarios is roughly the same for all destinations: 3-4 minutes for option 1 (traffic oriented signalling) versus 5.5-6.5 minutes for option 2 (pedestrian oriented signalling). This implies that all of the added delay occurs east of Sherbourne because the delays do not grow as one moves further west. However, it does not explain where the extra time is actually spent including the effect of reduced capacity on Richmond due to the bike lanes in the Coalition’s model. If these lanes were added to the Maintain scenario, what would happen? Would they create a delay on the DVP independently of whatever happens on the Gardiner? 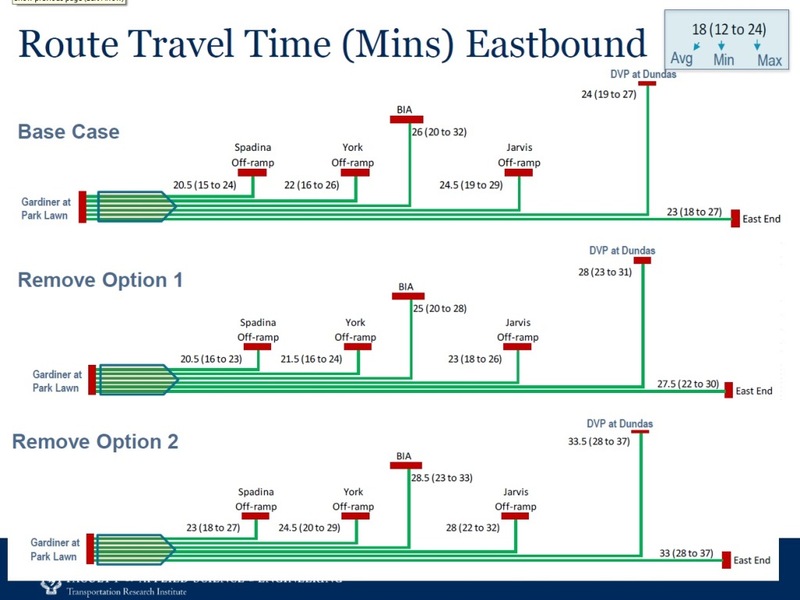 For eastbound trips, the spread between the Base Case and the Remove options grows as one moves further east, and for Remove Option 2 there is an added 2.5 minutes even for trips bound for the Spadina off ramp. This implies congestion reaching back across the core that adds more time to each trip the longer one spends in that segment. The extra trips that join the eastbound flow at downtown ramps have to be accommodated by the redesigned eastern section of the Gardiner, and the City model does not take them into account. 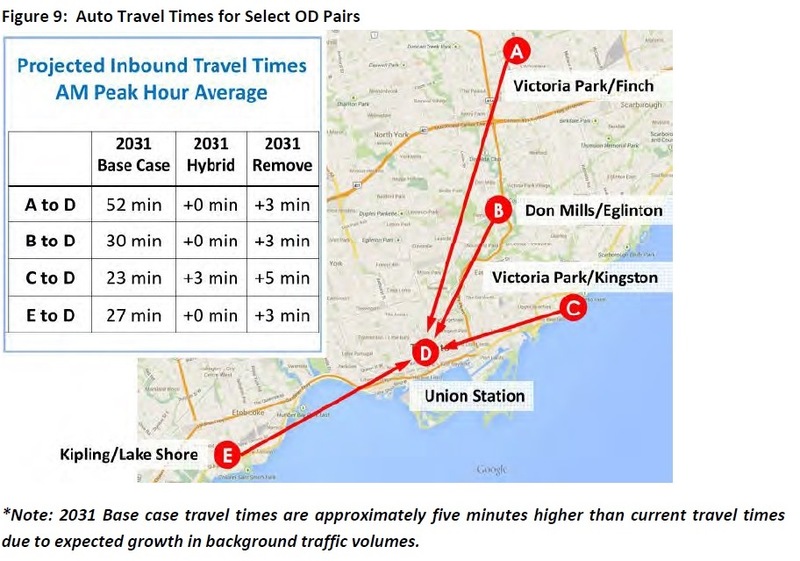 Updated May 12, 2015: In a comment, Karl Junkin has noted that the Remove Option 1 in the chart above shows lower times for the “high” and “average” values than the Base Case for traffic bound to the York, Yonge and Jarvis off ramps (albeit a small change). These effects require further study and explanation. 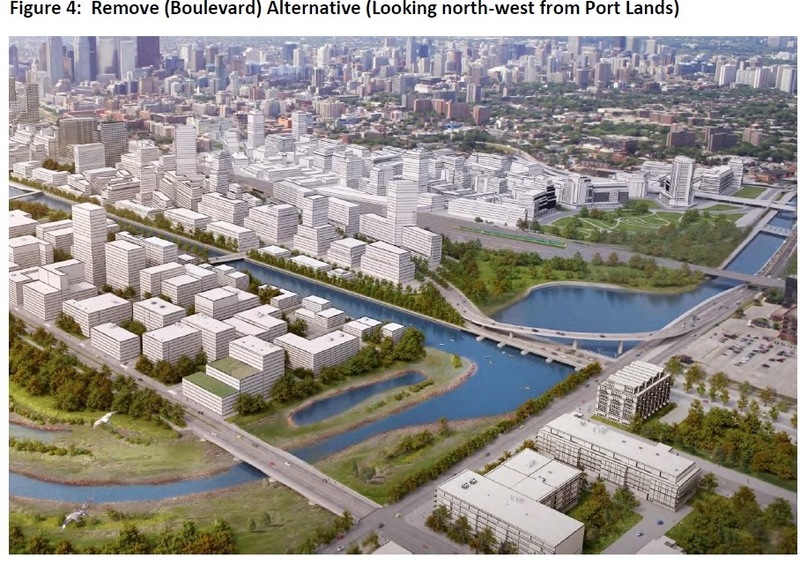 It is almost counter-intuitive that a change on the eastern portion of the Gardiner would have effects on flow in from the west, and it will be important to learn if the geometry of the modelled Remove option matches what the City’s Boulevard option actually proposes. The Coalition calculates a value for the time lost through added trip times through the core on a reconfigured Gardiner, and their clear aim is to show that this is a “cost” that must be weighed against capital (and future maintenance) cost of any Remove scenario. The challenge in such evaluations is that the “savings” of a faster road accrues privately (time and fuel savings) while the cost is a public one funded by taxes. What is missing from the discussion is the question of competing demands on capital and operating budgets for transportation facilities that would serve far more trips than the comparatively small number who enter downtown via the Gardiner. 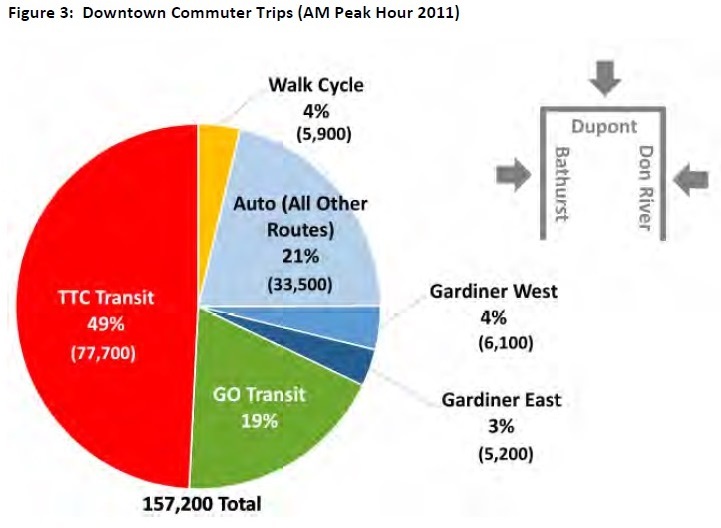 At great expense, we could make commuting times better (or at least not much worse than they are today) for Gardiner users, but what about the 68% of trips that are served by transit (2011), a figure that will grow over the decades because almost all new trips to the core will be on transit. There simply is no place left to put them on roads. What will be spent to serve this growth? GO/RER: Upgrade of the GO network to support at least a 15-minute all day service on most or all branches, with more frequent service on some corridors. SmartTrack: A proposed frequent service also on a 15-minute headway proposed to run from Unionville to the commercial district south of Pearson Airport via the trackage used by the Stouffville and Kitchener services, branching off at Eglinton into a separate tunnel westward. This scheme will doubtless run into implementation and funding problems because of track time constraints on the shared GO corridors, and the dubious (and expensive) western leg via Eglinton. This could very well wind up as a subset of GO Transit operations, possibly with its own logo and fare structure depending on how much Mayor Tory has his heart set on implementing a unique service that sprang from his campaign. DRL: A subway line with three possible segments: (1) a core link from the Danforth Subway to the vicinity of Union Station, (2) a north-easterly extension to Don Mills & Eglinton, and (3) a northwesterly extension linking to the Bloor Subway. This is an expensive project whose purpose is to divert demand from the main subway interchanges at St. George and Bloor-Yonge. This provides added capacity to the north-south lines and reduces the need for complex changes to increase the capacity at those interchanges. SSE: A subway line running from Kennedy Station to either Sheppard Avenue or to Scarborough Town Centre via a route that is still to be decided. This line directly competes with the Stouffville GO/SmartTrack corridor. Waterfront East LRT: An LRT line mirroring the existing Harbourfront route on Queens Quay West that would eventually operate south into Villiers Island and potentially hook up with a Broadview extension and with the already-built spur on Cherry Street that ends at the rail corridor. Broadview LRT link: If Broadview Avenue is extended south to Commissioners through the First Gulf site, a direct service from the Danforth Subway at Broadview Station to the eastern waterfront would be possible. There will almost certainly be a GO station to serve new development at the Don River, but GO/RER (and SmartTrack) cannot provide the fine grained service to address new employment and residential demand in the eastern waterfront. Their role is to provide for metropolitan and regional travel into the core, the same type of demand that the expressway network serves. At a finer grained level, both the DRL and any new waterfront transit would handle the local trips including links to the regional network. In a few decades, the eastern waterfront may be home to 50,000 in an area that has seen little development since an industrial heyday beyond the memory of most Torontonians. Tens of thousands more will work and go to school there. Where is the debate about how all of these trips will be served, how the neighbourhoods will function without good transit? An elevated Gardiner is almost a non-entity for local travel to, from and within a small new city on the edge of downtown. All of the “Gardiner” discussion has concentrated on the time that would be lost for road traffic, but the wider question for any investment is where it should rank against other possible uses of limited capital. Studies are now underway to determine the relative performance of options for most items listed here, but these will not be available until Fall 2015. In a rush to “fix the Gardiner” and to placate road users whose primary concerns are congestion and gridlock, we might launch down a path that precludes more investment in transit and a recognition of its vital role in the economy of downtown Toronto. One must also ask why transit projects must beg and compete for funding when keeping the roads flowing seems to be essential at any price. 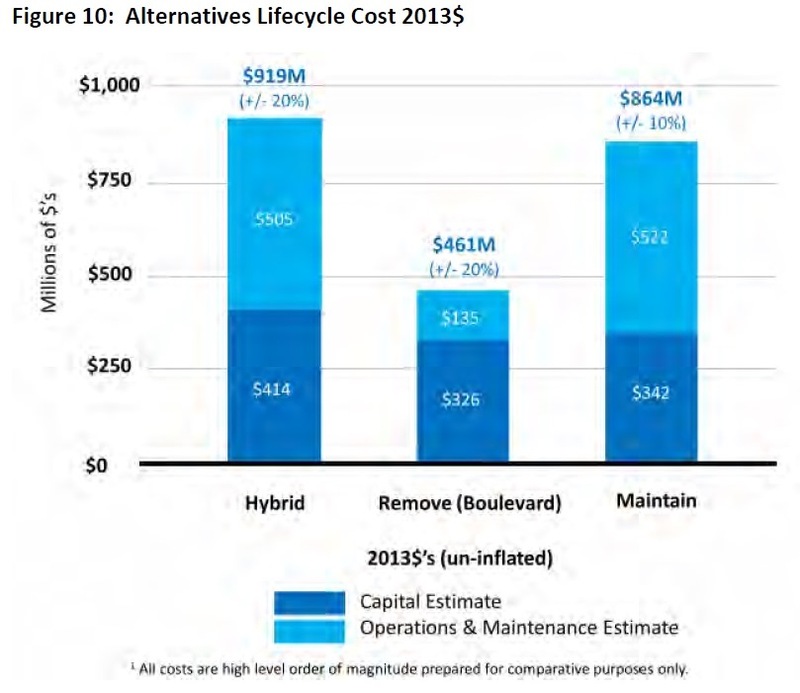 The cost to build each of the options ranges from $396-million for the Maintain scheme up to $524m for the Hybrid with the Remove option slightly higher than Maintain. All three options will cost substantially more than the $232m now set aside in future capital plans by the City, and this will challenge the City’s overall debt management strategy. 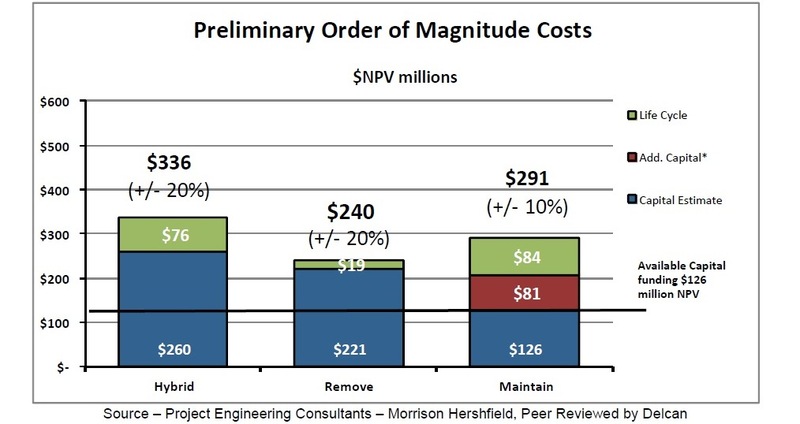 Estimates for the Hybrid and Remove options have a ±20% margin because these have not been subject to detailed design, whereas more work has been done on the Maintain option and its estimated cost is felt to be accurate within a ±10% margin. The debt management issue is a particularly troublesome one because current projections show Toronto hitting its self-imposed ratio of debt service costs to tax revenue of 15% by 2020 leaving no headroom for added borrowing for a multitude of projects. Either a very generous Tooth Fairy will appear to resolve this problem, or the City will have to make difficult choices about raising taxes to support additional capital debt. Construction is only part of the story, however, because elevated expressways cost more money to maintain than roads at grade. The future cost of alternatives using an elevated structure are substantially higher than the Boulevard option because, as the Gardiner regularly reminds us, elevated roadways do not last forever. Even with improved road building technology, there will still be higher costs. This chart has appeared quite regularly and the $919m Hybrid price is often quoted in comparison to the $461m for the Boulevard. However, much of the maintenance is in the future, and for present day comparisons, this is reduced to “Net Present Value” – the amount of money you would have to invest today so that it would pay all of the future expenses. Even the construction cost is lower on this basis because the work will not actually start until 2020. There is still a difference between the options, but the numbers are not quite as imposing. Any comparison to transit projects must also look at costs, benefits and when these will occur to put the proposals on an equal footing. For example, the Gardiner Coalition prices out the cost of time for vehicles delayed in traffic, but we have heard nothing about the value of time for the much higher number of riders (present and future) who will attempt to use the TTC and GO systems. The City’s study will come to the Public Works and Infrastructure Committee on May 13, and then to Council on June 10-11. In some political circles, the imperative is to “decide now” because (a) the expressway will fall down at any moment and (b) the wind appears to be in the sails, so to speak, of those who want to keep an elevated roadway in whatever form. However, there are many unknowns, notably the assumptions, validity and implications of competing traffic modelling exercises, and the need to understand how any expressway configuration will behave as part of a larger downtown road network. Probably the most important unknown is the future role of transit: where will it be, what types of demand will it serve, will getting to the core be easier for someone in Unionville or Bramalea than for someone in Scarborough, The Beach, West Toronto or Etobicoke? What will happen if we don’t expand the transit network to meet demand? Will Toronto rise to the challenge of providing service to its growing, dense downtown business district, or will a pre-occupation with a relatively small commuting demand hi-jack the very necessary debate on the limits of funding, not to mention the dwindling role of road traffic? Will the future prosperity and attractiveness of downtown be defined by a chunk of expressway that serves a small minority of commuting traffic, or by a commitment to very substantial additions to the transit network’s capacity to deliver riders to those shining towers so favoured by those who are Toronto boosters? Council should not be rushed to decide immediately on a Gardiner option until the studies now underway for transit options are on the table. This is a short delay in the time scale of all of the projects, but it gives us the opportunity to look at them all, to decide where those precious taxpayer dollars should go. 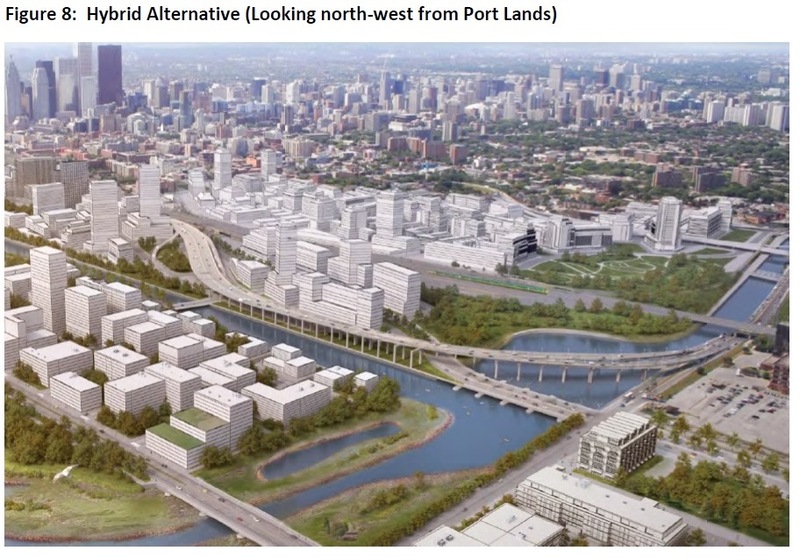 This article has deliberately avoided two components of the debate and reports: the questions of city building and urban design as these would be influenced by whichever Gardiner survives into the next decade, and the Goods Movement Study that addresses the needs of commercial traffic both from the Port Lands and other industrial areas east of downtown, and for access by commercial traffic to the core in general. I wanted to concentrate on the transit vs road tradeoffs, and what, to me, is an undue focus on one component of a very complex network. No matter what we do, making everyone happy is simply not possible. Today’s squeaky wheels represent too small a part of the total population and travel demand. They should not dictate the outcome of the larger discussion. This entry was posted in A Grand Plan, Downtown Relief Line, Waterfront. Bookmark the permalink. However, Matthew it tells a great story, and that is what it is all about no? The issue of course, is that the issue of poor transit service in some areas, and the increase in congestion, will make some of these areas will make them less desirable, and harder to access real employment from. However, this is exactly what may happen if those who are looking at subway as the only cure manage to push for subway only. It will mean large areas with extremely long in traffic bus rides to a meaningful connection. Etobicoke (home of the former Mayor) on the other hand, has a Bloor Subway that ends in the middle of nowhere really – it doesn’t even end at Sherway Gardens which makes more sense as a “node” than Scarbough Town Centre does. You don’t need shopping to have a node. Kipling/Islington are on a busy thoroughfare with good connections to Mississauga on Dundas, Burnhamthorpe and the 427. If anything the six points interchange focuses traffic there. I think it’s a great location for a terminal. Would an extension to Sherway help? Yes but I’d wager they’d still preserve the Mississauga transit terminal at Islington and most of the TTC buses at Kipling. Simply put, Ford assumed that Etobicoke would vote for him no matter what. That’s why he made no effort to bribe them. That can’t be right – it implies Rob Ford used logic. The map projecting Toronto to 2025 is a little misleading – there are many area in Agincourt and north-west Scarborough where there are wealthy suburban streets (Huntingwood etc.) or condos (Bridlewood) but a few apartment buildings that were once middle class under rent control have been bringing the average down. I’d prefer not give the Star any hits for another slanted article but since you brought it up … This article discusses the “STAR’S” fears of what will happen if Toronto’s neglected areas receive their fair share of transit. Geez. So scary to think we’d have to invest in quality transit throughout the City and be forced to share the weight of income inequality. Enough is enough. Giancarlo – I think having shopping and other things are important to a node (or a “Centre” under the Official Plan), and like with Steve, I am not a big fan of the 60s idea in Scarborough of building a “Downtown” around a shopping mall (Kennedy Road or the Golden Mile would have been a more fitting choice for a City Centre – still possible if the City planners had any imagination and spend the money ($1-2billion) on moving Downtown rather than building a Subway to something that should be abandoned as a City Centre). But in terms of a transit node, Sherway would have better access to the QEW and 427 for transfers to buses (In the 70s, I used to catch a bus to the University of Waterloo from Bloor – no doubt there are others that would benefit by making one major transit hub at Sherway). Steve: Just for historical completeness, for those who don’t know, STC is where it is because Eaton’s owned the land for the development. It was not a case of careful planning. Once that decision was in place, then any emphasis on Eglinton either at the Golden Mile or at Kennedy would be counterproductive, at least to STC boosters. I guess it will only help the narrative around this blog that most Scarborough citizens don’t travel downtown. Couldn’t imagine why? This is just willful ignorance. Perhaps the biggest project that Steve and the others on here who you constantly accuse of trying to screw Scarborough are currently championing is a DRL that will run on the east end of the city. They do this because they believe there are currently enough people travelling downtown via the Danforth, specifically originating east of Pape, that it justifies an entirely new, multibillion dollar subway line. You’ve twisted yourself so far to frame yourself as persecuted yet again that you’ve fallen into complete fantasy. I guess it will only help the narrative around this blog that most SSE advocates are full of hot air. Couldn’t imagine why? Until then efficient, attractive access for everyone in Scarborough will be available to get in and out of the core on the TTC. I don’t know why I keep bothering with this, since you clearly disregard anything that doesn’t fit your twisted worldview, but this is utter nonsense. The SSE, along any of the proposed corridors, will not provide “efficient, attractive access for everyone in Scarborough. If you’re at Warden and Finch, or Markham and Kingston, or Meadowvale and Ellesmere, the SSE will save you somewhere between 0 and 5 minutes, and you’ll spend approximately the exact same amount of time on a bus as you did before. But hey, that’s not where you live. In fact, where you live will probably see the greatest improvement in travel time to the core. Particularly if they were to follow the Markham Road alignment you’ve expressed preference for in the past. But I’m sure your feelings are all to do with your innate understanding of Scarborough, the one that none of the rest of us could possibly understand, and which you seem unwilling or unable to put into actual words. Nothing at all selfish motivating you here. Kudos Steve. Excellent work, beautiful illustrations. This photo, taken from the railway berm about fifty yards west of Cherry, shows half a kilometer of the rusty Gardiner in 2009. I think the waste land to the east (left) is roughly where the more northerly alignments would run. It’s in the public domain. I can’t help wondering why people aren’t insisting that developers who buy and develop valuable waterfront land, freed up by moving to a more northern alignment, should shoulder a big share of the cost of realigning the Gardiner and/or Lake Shore Boulevard. Have I missed such suggestions? Steve: The problem with the more northerly alignment is one of engineering and of conflict with other planned or existing structures. It’s not a question of getting someone to pay for it which, in any event, they will do in part through Development Charges for which there is a provincially mandated formula. An intriguing point came up at Public Works & Infrastructure Committee on Wednesday where the owner of some of the land in this photo, who has been working on a plan for development here based on the “Remove” option, was surprised to find that the modified “Hybrid” option bisected his property. The first he had heard of this was mid-April, and he was not happy. About half of the land you are talking about is already owned by the City. Their benefit, if any, is from development of that land which generates both capital (from sales and DCs) and operating revenue (from taxes). Putting an elevated expressway on the land “poisons” it and nearby parcels for development. As for the illustrations: they are all taken from various reports. My only work is in selecting which ones to use to support the thread of the story. I don’t see the attraction of Sherway Gardens as a new transit hub. The QEW tends to be dead slow just west of the 427, and it looks to me that it would be a major task to add a bus lane. There is also very little in the way of local residential or walk-on demand, and Etobicoke Creek immediately to the west of West Mall is a significant barrier. Sherway is a “convenient” location for suburban drivers using the freeways (when they’re not crawling), but Dundas/427 is a much better location for transit riders as a hub. If this is an issue of freeing public land, would that not in effect be baked into the price? If you are going to insist they pay for it as an additional item, will it not merely reduce the transaction price on the land? If it is not public land, what mechanism do you use? How do you actually specify the increase in value that can be attributed to the specific property? Steve: There is a formula for this in the provincial Development Charges legislation. New development can only be taxed for changes required to serve the development. Making things better for existing users (or for future users who are not part of the area that will benefit) is a general cost born from regular taxes, not from DCs. In other words, a new condo towers only pay to the extent that new infrastructure is required to serve them, not for the benefit a new rapid transit line brings to existing bus riders. There were also objections from a large number of people in Guildwood who realized that the expressway would have increased noise and traffic in their area. They felt the negative impacts would have outweighed the benefits. Ed – For Sherway, I was thinking more about buses coming in from the north-west (401) and down 427 rather than along the QEW – since there is GO rail running parallel to the QEW – Islington/Six Points is a little too far from the highways to be a good bus node. Dundas just east of the 427 would have been better to bring together GO, Subway and Bus. The real problem as I see it is that the hub and spoke idea of jobs downtown and everyone commuting long distances to work is not very efficient and hasn’t been well planned (there are few office sites left, and now First Gulf wants to create a Canary Wharf like second financial district on the Unilever site – and wanting the City to spend 100s of million on the Hybrid solution to make it work better). Ideally jobs should be closer to where people live as other than the FIRE head offices etc. most jobs do not need to be on expensive Downtown real estate. Steve: Wrong! First Gulf has explicitly stated that they can live with either the Hybrid or Remove option, anything that takes down the Lake Shore ramps in front of their property east of the river. This was part of the deputation by Alfredo Romano, the head of First Gulf, to Public Works & Infrastructure Committee on May 13. I don’t see a lot of vision or real planning – just a mish-mash of planning and transit policies that don’t match reality of the underlying economic realities of how cities work, particularly the reality of 50 years of suburban sprawl that is now part of what we have to cope with. The idea of the 4 “Centres” in the Official plan is a failure in my view – in that all that is being built in these Centres are condos, not jobs. In the 90’s all the job growth was not in the 416 but in the 905, almost entirely dependent on cars, while office jobs in the inner suburbs have been declining – particularly at Don Mills and Eglinton though Consumers Road has had some losses of older office buildings. Lastman’s North York started out well but the last office building was about 10 years ago. The tax breaks that the City of Toronto has given office development (no development charges, 10 year tax breaks etc.) has done little to reverse the trend. I won’t return the favour by sending personal attacks back at you. But I really don’t appreciate the false sentiment regarding my previous comments. 1.) I’ve never accused Steve of trying to “screw Scarborough”. Politicians on both sides of the debate do that job quite well. We have differing views & I actually don’t oppose the DRL in anyway. The debate shouldn’t be DRL vs. SSE to begin with. Nor should it be a patchy LRT plan vs. SSE. 2.) I would advocate for transit improving in all of the GTA including the core. But certainly the most neglected areas as a priority & without leaving large areas out of the funded plans. That’s not just Scarborough IMO. 3.) I don’t live near any stops for the proposed SSE route thru McCowan or Markham Rd. But yes I see the long term benefit for all Scarborough when compared to the patchy LRT plan. Which you don’t agree with and that’s OK, it’s your opinion. I actually live near Morningside & Sheppard which was actually a proposed LRT location. Go figure? 4.) Scarborough does have differing needs & to gain consensus there needs to be a better plan funded otherwise consensus out here will be the subway extension. Steve, what’s with the Toronto Star now fully supporting John Tory’s choice for the Gardiner? Steve: The editorial boards of newspapers are typically more conservative than many of their writers. I will be amused to see how, in the future, they react to other similarly priced projects and the taxes needed to pay for them. With regard to a Cherry Street bridge over Lake Shore Boulevard. Currently Cherry Street goes under the railway embankment that carries five railway lines. So, this bridge would not only have to go over Lake Shore Boulevard, it would have to go over the Railway embankment, which is at least 5 meters tall, and have to be tall enough to let those double decker GO Trains go under. That must be 15 meters or more. What is incline percentage for these bridges? The ramp to this bridge would cut off Front Street, right where it is supposed to be the gateway to the West Don Lands. Would this ramp be too long to come down on Villiers Island? Steve: Cherry is never going to cross Lake Shore on a bridge not just because of the railway corridor, but because of the Gardiner itself. Also, Cherry is planned to be an LRT connection south from King to Queens Quay and beyond. There is also the small problem that if Cherry is up in the air, it could not connect with east-west streets without more ramps. I think that Steve is understating the amount of work he does for free. “selecting which ones to use to support the thread of the story.” is not a matter of quickly skimming over a bunch of stuff but one has to read and understand a lot of technical stuff which Steve has a natural talent for. Some of these reports are also very long plus Steve puts in a lot of time taking his own pictures at various construction sites for the sake of sharing with all of us. Thank you Steve for putting all the hard work that you do. Being from Canada’s poorest borough, Scarborough, I disagree with you on most issues but I much appreciate all the hard work that you do. P.S: I am not really from Scarborough as I am not originally from Canada but I have lived all over Southern Ontario and have strong connections to Scarborough and I get upset when Downtown tries to take Scarborough’s share of tax dollars though I have very strong emotional attachments with Downtown too. It’s about fairness, man, and Downtown Toronto has a much higher per capita spending of tax dollars than anywhere else in the city and the province. If I understand the “hybrid” option correctly, it is 100% following the existing alignment. Either the bridge deck will be replace or the deck and girders. The only difference is in the location of a few ramps. It sounds like the “hybrid” is actually the “retain” (with the required maintenance), with a few ramp changes just to make it appear that they are compromising. Steve: Yes, the major change between “Maintain” and “Hybrid” is the shifting of the ramps to Lake Shore west of the river. WRT north south bridges over a realigned Lake Shore Boulevard, whether at Jarvis, Sherbourne, Parliament or Cherry… I went on a photo excursion this morning, and realized that, due to the proximity of the big railway berm, those bridges would have to be taller than the current Gardiner itself, as the berms are pretty tall, and the big bilevel GO Trains that travel on them are all also tall. Here is one of the photos I took, the first excavation for those many condos south of Queen’s Quay. It’s public domain. The surprising thing is that it isn’t that deep. The basement of George Brown’s Medical campus, 100 meters west of there was excavated more deeply. Only a fraction of the condo owners will get a parking spot. I guess they will have to use the LRT. The Embarcadero freeway was a total eyesore that ran along prime bayfront land and theoretically was meant to connect the Bay Bridge to the Golden Gate Bridge. It carried as many as 70,000 vehicles a day. There was quite the vehement debate over tearing it down for many years. I wonder how much of the traffic is just taking the long way through Oakland via Interstate 80 and 580 and avoiding the former Embercadero Freeway and Golden Gate Bridge? Maybe the fact that pretty much all the job growth in the Bay Area is south of San Francisco also has something to do with it. I don’t believe this “induced demand” idea, deliberately reducing road capacity because you are anti-car will inevitably make traffic worse, even if a few people stop driving. There is essentially only one highway into downtown Toronto (the DVP/Gardiner) and the DVP has the worst congestion of any highway in the GTA. Creating a gap in this highway will cause severe traffic problems. These transportation models obviously use dubious assumptions, I do not believe that the downtown relief line is going to be built anytime soon and we are talking about a huge amount of development on the Unilever site which will put far more traffic on the eastern end of the Gardiner. When DVP or Gardiner is closed for construction, when the Gardiner was narrowed to 2 lanes for construction earlier this year, when the “Ride for Heart” closes highways, when yet another special event closes Lake Shore, the traffic gets much worse. I am not looking forward to the narrowing of the DVP and other highways for Pan Am Games lanes which will also make traffic far worse. You cannot pretend that cars do not exist and that everyone will take transit (especially when we have a tiny subway system, GO electrification is 10 years away and all we are building is the most expensive LRT line in the world on Eglinton which I strongly suspect will be overcrowded). How are GO buses and delivery trucks supposed to get downtown with no Gardiner? Steve: Actually, the worst congestion on the DVP is well north of the Gardiner, and a lot of traffic leaves at the Eglinton and Bloor ramps. By the time it gets to the Gardiner, it is generally not packed like it is further north. There was an interesting article in the Globe And Mail by Alex Bozikovic. The Remove Option is the way to go. Hands down. Great article here [from the Globe & Mail]. 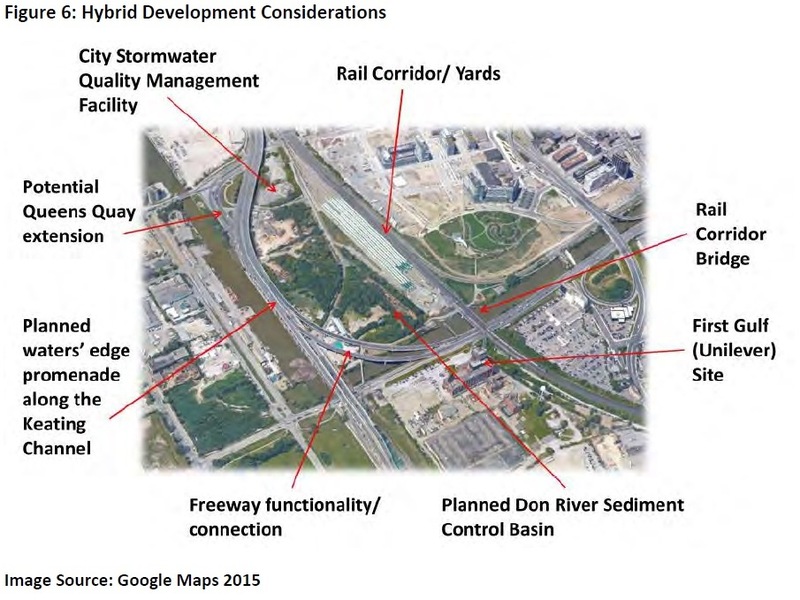 The Hybrid Option leaves most of the Gardiner west of the Don River intact, demolishes the ramps at Logan and the section east of the Don River, and money is spent on new ramps – which is why it is more expensive than the other options. The bottleneck on the DVP in the morning is cars backed up at the DVP/401/404 interchange trying to get on the southbound DVP, once on the DVP it isn’t that bad – and in the evening the congestion is all at the same place but the cars back up on the northbound DVP all the way down to Don Mills Road. Steve: I live at Bloor Street overlooking the DVP and rarely see congestion in this area unless there has been an accident somewhere for precisely the reason you describe. Sorry, what? Since when is Scarborough is Canada’s “poorest borough” let alone poor by any measure? There are wide swaths of the country (and Ontario) that are far more lacking in resources than any part of the GTA. It’s this sort of baseless hyperbole that renders this kind of criticism laughable. As for the eastern Gardiner itself, I favour taking it down. The expense for the “hybrid” option is excessive given the fairly marginal degree of transportation connection it provides. But if it is to be chosen, I suggest that it would only be acceptable as a toll road. Why should the entire city pay to subsidize the commute of a small number of people travelling from the east end and Markham? Are they unable to take the GO train? I returned yesterday to the Martin Goodman trail, to see if I could take more images of city land where the Gardiner and Lake Shore Boulevard might be located. The location where I took the photos in 2009 is inaccessible. The land immediately south of there is fenced off, and has had some construction. Several 3 metre wide concrete lined pits have been dug on the property. Steve: This is the storm water management system shown on Figure 6 in the article. This photo was taken about 200 metres east of there. You can see the Gardiner through the trees. Here is a link to a map showing where the image was taken. My photo is public domain. The issue really has to be as you note, how big a benefit, for how many, at what cost. Here there is of course the massive cost of the roadway, out of keeping with the benefit, but there is also the notable negatives, in terms of the community, and tax base. I would like to note, that these costs are likely to also be very substantial, and they far outweigh the couple of minutes of travel time imposed on the few who really must drive (very few into the core). There is a small number that must drive cross core, however, that is few, and most of those areas should be well served by transit (although much is currently overloaded). Steve: Note that there are non-monetary costs such as the lost opportunity cost in the Keating Precinct if the roadway stays where it is, and the implications for the Port Lands (e.g. “Villiers Island”) if there is a block in between the East Bayfront development and that south of Keating Channel. This cannot be wished away by “making users pay” through tolls or some other cost recovery mechanism. At the first Gardiner meeting, they had boards with some designs including an imaginative, even brilliant scheme by Rem Koolhass that involved running some roads around the Unilever/First Gulf site. It was certainly mind-blowing when I saw it. What does concern me here is the lack of an overall vision for this area, or maybe even for the whole city in terms of the next 20-30 years that looks at transit, population growth, infrastructure and our ability to pay for things and manage change. We had this with the “railwaylands” where the area was planned without considering the Gardiner’s long term viability or the need to maintain land so there was an alternative, no tunnel was put in place under Bremner Boulevard for future transit, then the Skydome was a disaster not just because of the unexpected costs (moving a pumping station, adding in extras) but because of the negative impact on the Ex and Ontario Place. And frankly the railwaylands are a disappointment – the same developer supposedly did a better job in Vancouver. There is lots of planning, bureaucracy, studying and arguing over everything in this city, but somehow we have lost the ability to do things wisely according to a clear and comprehensive vision, yet alone in a timely manner. “New York run by the Swiss” – not any more. New York densities yes, but on a city that can’t cope. Note that there are non-monetary costs such as the lost opportunity cost in the Keating Precinct if the roadway stays where it is, and the implications for the Port Lands (e.g. “Villiers Island”) if there is a block in between the East Bayfront development and that south of Keating Channel. This cannot be wished away by “making users pay” through tolls or some other cost recovery mechanism. I can’t find it online, but if I’m remembering correctly, an article in Saturday’s Star mentioned a developer that owns 4 acres of land in the area. They claimed that the rebuilt Gardiner would need part of their land for ramps, and would cut the other part off from the water, and as a result the developer would expect tens of millions of dollars from the city in compensation. Combine 10s of millions (so far) of unaccounted extra expenses – I’m sure there’s more than one developer who would want to be compensated for the loss of value of their land – with the millions (annually) that can be gained in property taxes from creating favourable conditions for development, and I’m sure the actual cost to the city of the rebuild plan is at least twice the currently forecast (construction-only) cost. Steve: The developer is Alfredo Romano of Castlepoint whose “3C” project is bisected by the “Hybrid” Gardiner. The waterfront sidewalk on the west side of Polson Pier, is public land, all the way from the Polson Slip to the channel to the turning basis. I didn’t realize this at first. The restaurant on the NW corner of the pier regularly blocks off the path, and I was worried I would be harrassed by the restaurant staff, for trespassing, if I walked south to take photo. About a year ago I read an old article where a judge ruled that a photographer who wanted to walk south, and had been arrested was correct that the sidewalk was public land, and the restaurant had no right to block it off. I’d like to see a similar strip of public land lining at least one shore of the Keating Channel. I’d like it be wide enough for a hot dog vendor or ice-cream bicycle. “There is lots of planning, bureaucracy, studying and arguing over everything in this city, but somehow we have lost the ability to do things wisely according to a clear and comprehensive vision, yet alone in a timely manner. I am really thinking it is neither a lack of wisdom, nor vision, but rather a lack of political will, and dealing with an electorate that is unwilling to believe that there is a requirement, unless and until it has a direct impact on them personally. So I believe that is perhaps a lack of faith and goodwill. There is a great need to return to debate informed by good planning, where bringing to the fore, that this idea came from a political campaign, not city planning, draws it into deep question. We’ve become similar to the US. No one works for the people & our voters are forced to choose a polarizing side. In the end it really doesn’t matter who we choose as none of the parties are going to raise taxes & none of the parties are going to build for the people unless there’s major political gain. The only winners are the lobbyists with ties to the winner. We all know about the Liberals wasting billions just to buy 905 votes to hold power & cater to the rich Oakville/Mississauga lobbyists. That doesn’t make the Cons or NDP any better as they are pigs in the same trough wearing a different shade of lipstick. Seriously having Politicians make decisions on small tickets items for the people is great. But they have shown no ability to be responsible in planning & funding major projects. It’s not 1900 anymore & the people should be allowed to vote electronically on major issues at all levels. Even if we get it wrong it will be more efficient than politicians. I do not believe this will be any better, and likely be worse, as one issue voters, will truly run the day, as many people will not bother to come to vote on issues they themselves see as a low priority to them. This will likely lead to one extreme or other, with say the Beach area drivers coming out in droves on the Gardiner East, McCowan precinct voters coming out in droves on the subway extension there, Sheppard East subway supporters out in droves on that one. This pattern on-going until taxes start to go up notably, and then there will be large tax as the only consideration voters coming out to vote everything down, even motherhood and apple pie. Like I said only major decisions would go to a vote and if done electronically would give almost everyone an opportunity. This could be done once a year during regular elections. Politicians would lay out their “facts” and we would decide. I think everyone would learn quickly to vote if they don’t want to be drown out by special interest groups. If they choose not to vote… oh well. At least something will be built and not torn up, cancelled, filled in, etc. for political purposes. Joe suggests electronic voting would allow the people better input into the political process. I am a longtime reader of the RISKS digest — risks to the public through the use of technology, published since 1985 — highly recommended. If you consult the archives you will see universal caution among computer scientists about the unfixable dangers of electronic voting. Call me a curmudgeon, but I am not comfortable about voter drives that encourage young people to vote through celebrity endorsements of voting, or peer pressure. Genuine participation in the democratic process requires hard work. It requires a populace with a determination to be well-informed, and to listen to all sides. Frankly I would prefer that uninformed people, didn’t bother voting. Why did council go with the extending the B-D subway to Sheppard, when the LRT option was both cheaper, and generally superior, and would have had a greater share of the cost covered by higher levels of Government? I think Karen Stintz actually knew the LRT option was superior, but reversed herself to back the subway, because she thought she would be worthlessly squandering her political capital if she tried to swim against the Ford current and educate voters who were basically uninterested in becoming better informed. Steve: Stintz wanted to be mayor, and the path to that office did not include telling Scarborough that it didn’t need a subway. She and many other pols of every stripe got on that bandwagon, and nobody has the guts to fess up to having so badly misled Scarborough just to get their votes. I’m surprised that the idea of using Cargo LRT/Trams hasn’t brought up to counter this argument. Having goods delivered to a central depot outside the downtown core and shipped via an Cargo LRT down using new/existing LRT lines to smaller depots for local delivery seems like a better way to move goods while reducing the number of cargo vehicles that would have used the DVP/Gardiner for delivery. I know that this idea isn’t thought out as well, and of course someone will throw out there that traffic patterns in Downtown Toronto would somehow never support this idea. But if John Tory hybrid option goes ahead, then we’ll end up spending close to a billion dollars (if we’re lucky) to slightly modify the east of of the Gardiner while fixing this eyesore that has been falling apart since the day it was built just so some commuters don’t have to use public transit under the guise of “Goods Movement”. Steve: The streetcar track network misses some big chunks of downtown and I think this idea has limited potential. It’s the sort of thing that can evolve in a city with good coverage and where the freight capabilities are recognized as part of the network’s design. Toronto only has the lines that remain because advocates turned around the TTC’s abandonment plans in 1972. A far more important and generalized version of this recognizes that deliveries do not take place in “prime time”. After all, a cargo tram is not going to stop on King Street at 4 in the afternoon to drop off a parcel. Toronto needs to follow the path of other cities and ban goods movement in the central area during the daytime. Business will kvetch, but it will adapt. The biggest risk I see with e – voting is hacking and corruption. With the current disgusting politics at the Federal and Provincial levels it would be hard to keep corruption out if the cyber world. Although I fell the easier we make it for people to vote the more involved and educated people will be down the road. Even the most involved voters started off with no clue what was really being voted on. One of the biggest problems is we don’t teach democracy to all young students. And its one of our most important rights as Canadians. Anyhow just a rant. We can’t even build a couple km of roadway nor public transit. To think politicians are going to make themselves accountable in any shape or form in my lifetime without a revolution is absurd. Regarding electronic voting, there’s something important which should be made clear. Electronic voting is incompatible with the secret ballot. It is *completely impossible* to do do real elections with a secret ballot electronically. Every computer scientist agrees. If you don’t have secret ballots, then you can, in fact, have electronic voting. The security is created by people matching their names to their votes. It is best if there are multiple levels of security. One thing would be to give people a choice – instead of the advance poll, let people who don’t want to vote the old way to go into the Returning Office – they have to show ID (to prevent voter fraud) then they get a card with a serial number (recorded as part of one secure database) and password. They can then vote electronically (recorded in a separate database, and even change their vote, any time until the close of voting on election day. I get upset that many people vote in the Advance Polls because they are lazy or think this is a good thing to do – I was a candidate for Council and was annoyed when I would knock on the door that they had voted early. For some people who are travelling or working on election day, the Advance Poll is necessary, fine. But voting before election day is like writing a review of a movie based on the first hour and then walking out! Steve: If your campaign staff are keeping your voters’ lists up to date, you should know who has already voted before you knock. That would mean that you would need to refer to that list, before every door you knocked on, and then by-pass those doors – which would also have an effect on how you were seen in the community. Also – I would personally still find this frustrating – people deciding on a candidate, when they had not gotten to know the slate. If you have a conflict yes, vote early, however, generally, I would argue that it is better to get more information, allow people to present their ideas, or get seen changing them. Tory looked like a much better candidate to me (though less popular) when he supported the DRL, than once he floated the ST concept. The primary hope for him after that for me was that we would manage to back away from his positions, rather than being able to lay claim to having a popular mandate for the right thing. Chow ran on the blind hope that she could get elected despite supporting as close as she dared to what the planners suggested. I was not a great supporter of Chow at the start, but over the period of the campaign, (and once Soknacki dropped out) I found myself liking the fact that she at least was supporting the plans advanced my the planning department. If your campaign staff are keeping your voters’ lists up to date, you should know who has already voted before you knock. Maybe incumbent councillors or major parties in federal or provincial elections have enough volunteers to keep track of who has voted, but even they never have enough volunteers. Running for Councillor is even harder in terms of volunteers – and because signs are only up for the last 21 days or so things are worse in terms of name recognition and being able to skip homes you are unlikely to win over. Even if someone has voted at the advance poll, there might be other voters in that household who haven’t. Malcom N gets it. People who vote at the advance polls seem proud that they have done their duty – but it is like voting is a chore that they were eager to get out of the way as actually voting on election day is more inconvenient. Anyway, please go to the province’s website and submit your support for a ranked ballot, but also note that in 2018, the municipal election will be a mere 18 days after the provincial one – they should move elections to June and go back to 3 year terms instead of 4 years – we could have removed Rob Ford (or any of the other controversial mayors in Ontario) a year earlier since we lack a recall process and the rules make it impossible to remove anyone unless they are in jail.